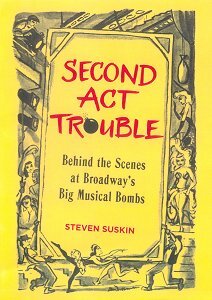 If you're the kind of person who enjoys gaping at car wrecks, you won't want to miss Steven Suskin's SECOND ACT TROUBLES--BEHIND THE SCENES AT BROADWAY'S BIG MUSICAL BOMBS. Suskin, a theatre writer and producer--he once was a gofer for David Merrick--has collected first-person accounts of twenty-five expensive productions that tanked on Broadway, taking down millions of dollars with them. Suskin's list doesn't involve vanity productions by unknowns. On the contrary, some of the biggest names on Broadway were involved with expensive turkeys, including Richard Rodgers, Jule Styne, Alan Jay Lerner, Harold Prince and Jerry Herman, to name but a few. On the performing side, the shows featured such stars as Debbie Reynolds, Melina Mercouri, Liv Ullman, Carol Burnett and Liza Minelli, yet they all drowned in red ink. "Every flop follows just about the same trajectory," Suskin notes. "Things start on a note of extreme optimism. As rehearsals progress, hidden worries arise. The tryout exposes flaws, and tensions as well. Everybody agrees on what to fix and how to fix it, or everybody disagrees on what to fix and how to fix it. They try--oh, how they try--and the show seems to improve. (Replacing a lousy song with a decent song will make that four-minute section of the show quantifiably stronger, and lift everyone's spirits. But what about the other six lousy songs?) A second round of bad reviews in the next city, en route to Broadway, sends everyone into severe panic. And that's when the fun really begins." Among the turkeys dissected in SECOND ACT TROUBLE are Hellzapoppin (starring Jerry Lewis), Breakfast at Tiffany's, Mack & Mabel, Golden Boy, I Remember Mama, On a Clear Day You Can See Forever and The Red Shoes. Some of these shows staggered on for a week or two, maybe even a couple of months, only to collapse of cardiac arrest. Some ran even more briefly, notably Kelly, a musical about Shipwreck Kelly, the man who jumped from the Brooklyn Bridge, which opened on a Saturday and closed the very next day, costing the investors roughly $650,000. It was the worst disaster in Broadway history and is well--if painfully--described by the Saturday Evening Post writer, Lewis P. Lapham. SECOND ACT TROUBLE isn't all sturm and drang, though. There is much humor and laughter in the 400-page book, plus juicy human-interest anecdotes galore. One involves the actor Nicol Williamson, who was starring in Rex, the ill-fated Richard Rodgers-Sheldon Harnick musical about Henry VIII. Williamson, a notoriously difficult-to-deal-with actor, came to dislike the show so much that he told columnist Liz Smith during the Washington tryout, "I feel as though I'm dying. Every single moment is like being taken away in an ambulance." Williamson garnered additional headlines after the show opened in New York when he bashed a chorus boy in the puss during the curtain calls. "The lad whispered to another actor 'it's a rap,' writes Suskin, "but the hypersensitive Williamson heard 'it's crap.'" The last word came from songwriter Harnick, who had this to say about the title song, one of many that were lost on the road: "Nicol was up there bellowing 'Rex Rex!' It sounded like he was calling his dog."